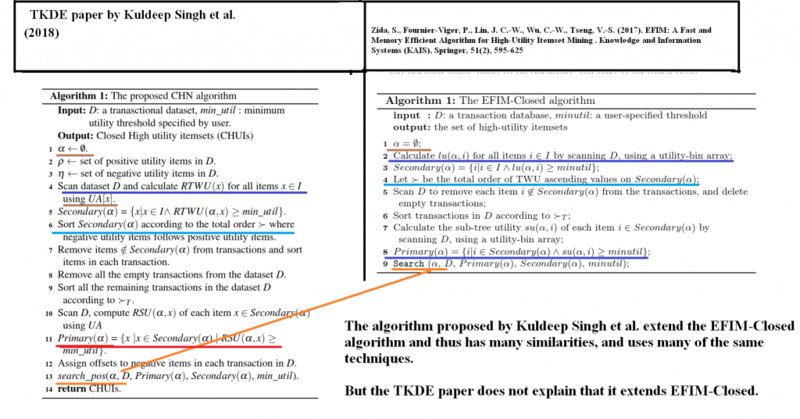 Harish Kumar Shakya and Bhaskar Biswas from the Indian Institute of Technology (BHU) (India) have plagiarized my papers in a paper published in the IEEE TKDE (Transactions on Knowledge and Data Engineering ) journal. I will explain this case of plagiarism below. What is wrong with that paper? That paper actually proposed a new algorithm called CHN for discovering closed high utility itemsets with negative utility values. In that paper, they extended the EFIM-Closed algorithm that I had proposed at the MLDM 2016 conference, but they did not mention it in the paper. Basically, they copied several techniques from my EFIM and EFIM-Closed papers without mentioning that they were reusing these ideas. They even renamed some of these techniques (e.g. the “utility-bin”) with a different name (e.g. utility array) and rewrote the text. Thus, it appears as Kuldeep Singh et al. proposed several of the techniques of EFIM-Closed, which is unacceptable. Some of the techniques have been adapted in the paper for the different problem, there is a citation for some upper-bounds, but some techniques are exactly the same and not cited. I will list the content that has been plagiarized in the paper and provide screenshots of a side-by-side comparison of the papers. 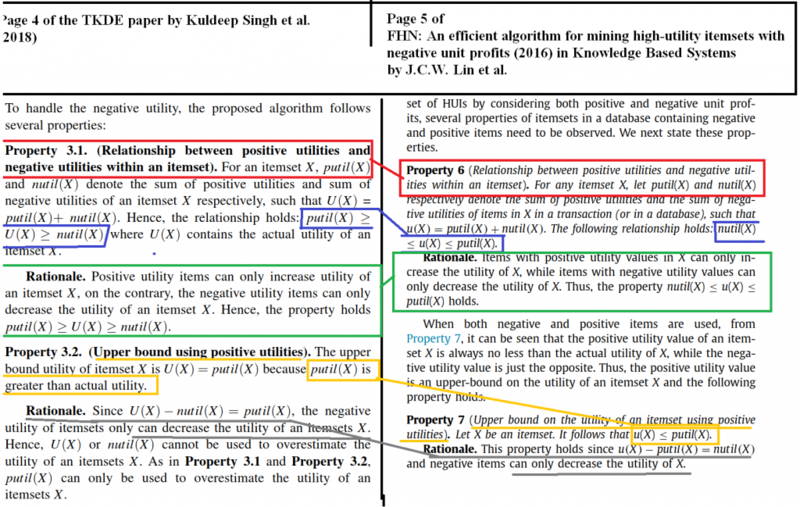 1) In page 4 of the paper of Kuldeep Singh et al., they copy several definitions such as Property 3.1 and Property 3.2 from our FHN paper in KBS 2016. 2) In Section 4.1, they present two techniques: (1) transaction merging and (2) database projection. But those are the same as in the EFIM-Closed paper. The authors rewrote the text. They mentioned that they could reuse a sorting technique from EFIM-Closed but failed to explain that basically all the idea in this section is copied from EFIM-Closed and unchanged from our paper! 3) In Section 4.2, they pretend to use a new technique called “utility-array” to calculate the utility, support and upper-bound of patterns. But basically, they just renamed the “utility-bin” technique of EFIM-Closed to “utility array” and rewrote the text. They copied the idea without citation and then used it to calculate utility and support in the same way, but also some other upper-bounds. 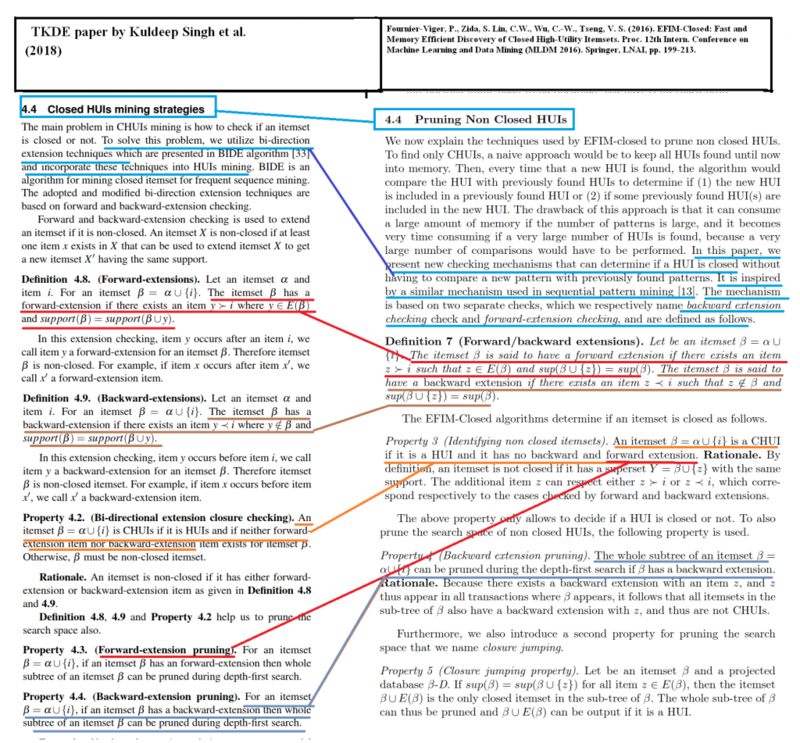 4) In Section 4.4, the techniques for finding closed patterns are all copied from the EFIM-Closed papers without modifications. 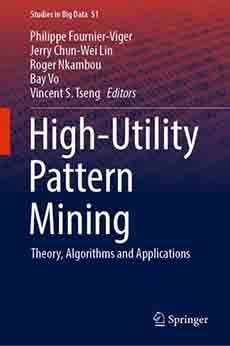 EFIM-Closed proposed to use backward/forward extension checking in utility mining, by drawing inspiration from sequential pattern mining. Kuldeep Singh et al. rewrote the text and claimed that they were the first to do that and just cited the sequential pattern mining paper that we cited in our paper. 5) In Section 4.5, they present their CHN algorithm that incorporates the copied techniques and also some other modifications. But the pseudocode is very similar to EFIM-Closed since they extend that algorithm. But they never explain that they extend EFIM-Closed as the basis of their algorithm. 6) The following figure look quite familiar? 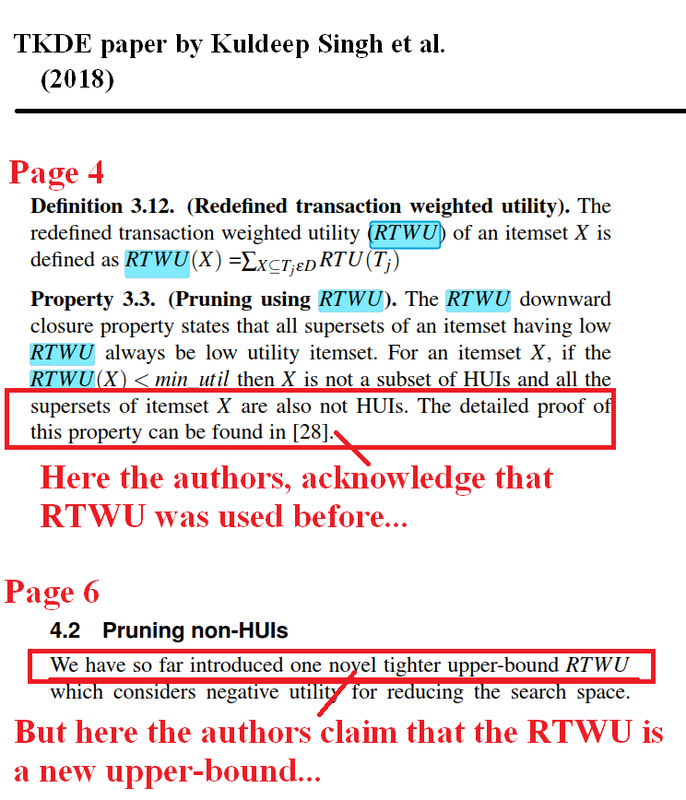 7) Besides, it is interesting that in Section 4.2, the authors claimed to have proposed a new RTWU upper-bound, while in Section 3 they had already acknowledged that it was from another paper! It is actually from our FHN paper. So is there any new contribution in that TKDE paper? Kuldeep Singh, Bhaskar Biswas et al. ? The only difference is the technique for checking that an itemset is closed using forward and backward extensions. But as I have shown before, this technique is copied from our EFIM-Closed paper in section 4.4 without citations. Thus, there is basically nothing new in the TKDE paper. Now another question is whether Kuldeep Singh, Bhaskar Biswas et al. cite their Expert System paper correctly? They put a citation (see below), but they also do not explain that the TKDE paper is almost the same as their Expert System paper. 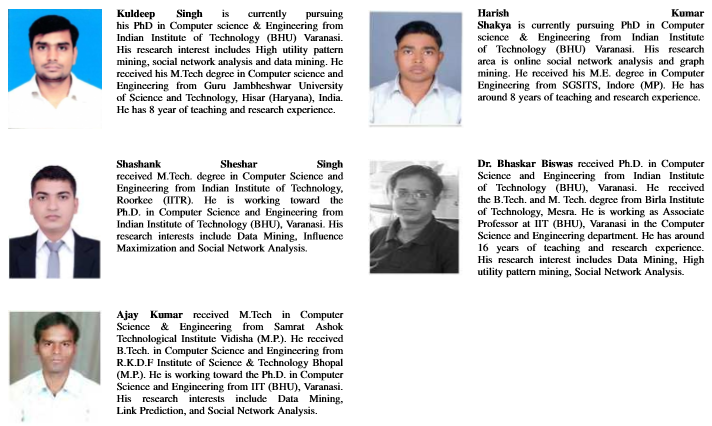 Here, Bhaskar Biswas is the first author, while in the TKDE paper he seems to be the supervisor of some PhD students. As usual, when I find some case of plagiarism, I report it to the journal. I have thus sent an e-mail to the editor of TKDE to report that case of plagiarism, and filled a formal complaint to IEEE to ask that they retract the paper, as soon as possible. I also sent an e-mail to the dean of the Indian Institute of Technology (BHU) and the dean of the school of computer science and engineering to let them know about what happened. The dean of the computer science and engineering school of IIT (BHU) has confirmed receiving my complaint, and told me that they will investigate this. I am waiting for them to tell me which actions they will take. The editor-in-chief of TKDE has also informed that action will be taken quickly. Thus, I expect that the paper will be retracted soon. But anyway, all I want is that the problem is fixed in a satisfactory way, as I spent already a lot of time to deal with this. 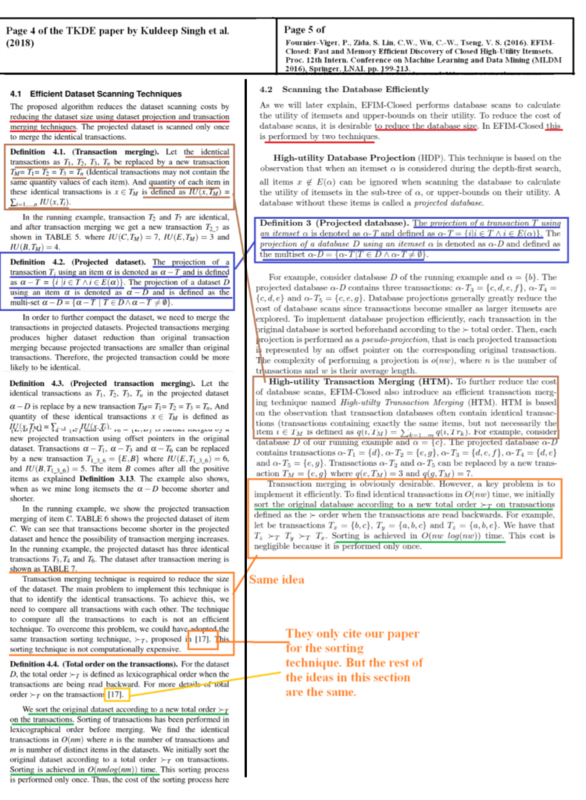 If the paper is retracted or fixed on the TKDE website to cite us properly and give the credit where the credit is due, I will be happy and also delete this page from the blog. Hope that this issue can be fixed quickly. What is the lesson to be learned? In general, there is no problem for a researcher to extend the algorithm of another researcher. This is what Kuldeep Singh, Bhaskar Biswas et al. did in that TKDE paper. They have extended EFIM-Closed with a few ideas to support negative utility values. That would have been fine, if this had been explained. However, the authors rather chose to copy several techniques without citing them and mentioning that EFIM-Closed was extended. Hope you have learned something from this blog post. That is all for today. Philippe Fournier-Viger is a professor, data mining researcher and the founder of the SPMF data mining software, which includes more than 100 algorithms for pattern mining. What is the job of a university professor? I didn’t read the TKDE paper but based on your analysis its main contributions seem to be undistinguished from your papers. Indeed, the contribution is very small and incremental. If they would have cited us properly, it would have been an honest but weak paper, and there would be no problem. But they rather chose to claim that they proposed several ideas already proposed to make it look as it their contribution was bigger. I think that this is the reason it was accepted in TKDE (and also maybe they got very lucky with the choice of reviewers)! A very informative and useful analysis done you you. Except Prof. Biswas, all are the PhD students. I think they have lack of such knowledge of plagiarism and did not told the full story to his adviser, but it should be the responsibility of the adviser to check such serious issues before submitting the manuscript. Further, the paper is published in a very reputed journal, I never send my manuscript to this journal, so dont know the review process. But, It may be surely sent to two to three reviewers at least. My question is on reviewing policy. How can only two or three reviewers judge your paper. Some times paper could not reach to the appropriate reviewer for the particular manuscript, and unfortunately such papers as you have mentioned have been published and some good manuscripts could not reach to world due to poor review. I would also like to know your view on this point. Yes, I agree with you. It could be the fault of one or several persons. But whether the advisor knew would be hard to prove. Even if he was involved, he would probably deny it. But I agree with you that there is still a responsability. If one put his name on a paper, he should have read it, especially the supervisor. Yes, it is indeed a very famous journal. And I was also surprised that it got accepted. Usually the review process is quite strict in this journal. From my experience, always at least three reviewers read a paper if not four. It is ironic that in 2016 my EFIM paper had been rejected from TKDE, and that now someone plagiarized this algorithm and published it in TKDE. But it shows that the set of reviewers assigned to a paper can have a great influence. If these people got very lucky, the reviewers were not familiar with the topic or did not check carefully enough to see the plagiarism. It happens. I think that out of 20 times, maybe it would pass through 1 time. As an author, if you believe that your paper is good, you can always try TKDE. It is difficult to get accepted but once in a while it works if you try many times and the content is good enough. I also do not submit often to TKDE unless I really believe that I have a good paper because the review time is long. As a researcher, what we can control is how we write a paper and where we submit it. Then, we have no control on the set of reviewers that is assigned to the paper. Sometimes we are lucky and get some nice reviewers, while sometimes the reviewers really hate the ideas in our papers and maybe there is not much we can do. But since we have no control on that, we still need to try sometimes 😉 That is what I think about it. Thanks for commenting on the blog. I hope TKDE will take strong action and author will be black listed for unethical practices. Being an Indian I really feel ashamed of this plagiarism as it happened from Indians’s finest university. I generally don’t blame the advisor, because as usual all advisors trust the students. It’s upto students to keep the trust. I will also contact bhu and talk with them. This needs strong action. I did my undergrad here and this is really embarrassing especially coming from one of the IITs. Thanks. Very interesting. So it is not the first time. 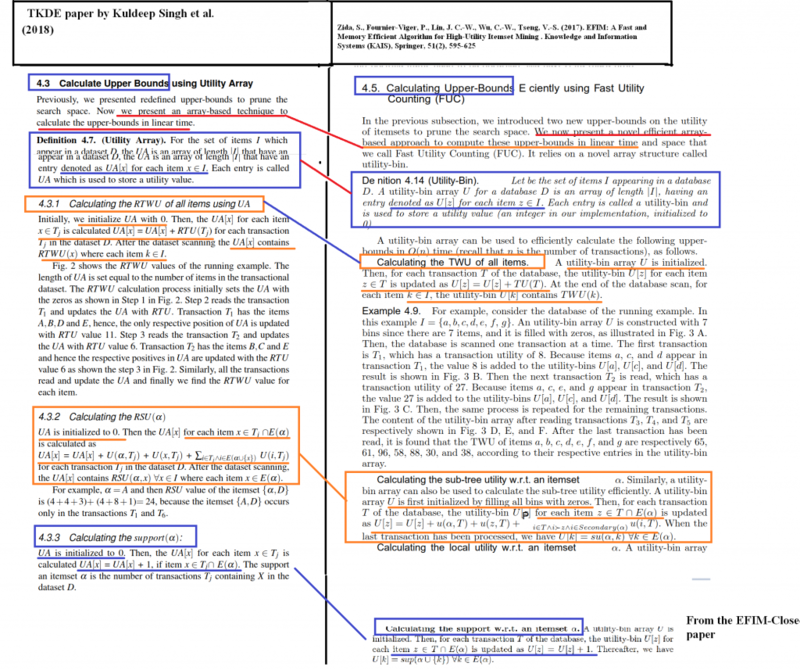 A paper by Bhaskar Biswas was previously retracted. But somehow he is still working at that same place. This is how people doing research nowadays. Academic/journal system is failing. yes, I also found this paper, which is really similar to our previous works. It is ok to extend the ideas from our papers, but it is really bad to only change the names of the items from other published papers. Any news? It’s been a few month.. Are they retracting the paper?